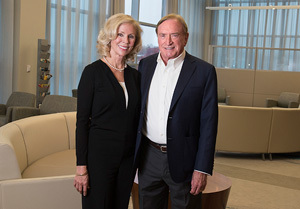 Cancer patients with deep-seated tumors can soon access a new treatment at the University of Maryland Department of Radiation Oncology thanks to a generous gift from philanthropists, Jack and Emily Howell. The Pyrexar BSD-2000 Deep Regional Hyperthermia System targets tumors with heat therapy, allowing the tumor to potentially become more receptive to chemotherapy and/or radiation. This state-of-the-art technology can help to improve the odds of people with cancer in the abdomen, pelvis and other areas of the body. The new hyperthermia system is part of the University of Maryland’s expanding Thermal Oncology Program, led by Zeljko Vujaskovic, M.D., Ph.D., professor of radiation oncology for the University of Maryland School of Medicine and internationally recognized leader in the field of hyperthermia cancer treatment. Jack and Emily, who reside in Florida, generously donated the funds for the deep regional hyperthermia system after Jack underwent his own cycle of cancer treatments. Jack was first diagnosed with bladder cancer in July 2012. Choosing not to have chemotherapy, he sought other forms of treatment, which worked well for more than two years. But in September 2014, Jack developed a serious cough that worsened over the next few months. That November, a biopsy on two nodes in Jack’s chest revealed stage-4 cancer. As Jack and Emily debated their next move, hyperthermia treatment came to mind. Emily knew of several people with cancer, including her sister, who had positive outcomes with hyperthermia treatments in Germany. Jack and Emily researched hospitals in the United States that used hyperthermia therapy, which led them to Dr. Vujaskovic. Unfortunately, Jack’s life-threatening cancer node, which pressed on his thorax, sat too deeply for the type of hyperthermia treatment available at the time. The equipment was only capable of treating “superficial tumors” that were no more than two inches below the skin’s surface. Dr. Vujaskovic, however, still thought he could improve Jack’s condition. He treated the node with 10 rounds of pinpoint radiation with great success. Dr. Vujaskovic also treated Jack for pneumonia and helped him enroll in an immunotherapy trial program at Emory University. Even though Jack was not a candidate for hyperthermia treatment, he and Emily believe in the benefits of hyperthermia therapy and are grateful for Dr. Vujaskovic’s lifesaving care. It’s why they felt compelled to support the Thermal Oncology Program and give patients, with cases similar to Jack, the chance to benefit from heat therapy. The new deep regional hyperthermia system is one piece of the Thermal Oncology Program. The Department of Radiation Oncology continues to seek additional philanthropic support to help renovate and expand the clinical space, provide resources for studies and trainings, and fund a new endowed professorship. “We will be the first institution in the U.S. to have the capability to treat cancer patients with proton and thermal therapy at one location,” says Dr. Vujaskovic. Proton therapy is a highly advanced and precise form of radiation that limits the dose to surrounding healthy organs. To make a gift in support of the Department of Radiation Oncology, please click here.